The best hiking in southeastern Michigan is in Pinckney Recreation Area, and the Crooked Lake Trail is another reason why. This 5.1-mile loop is a pleasant walk that traverses hardwood forests, marshes, and grassy hillsides. Along the way, you pass three inland lakes, climb to 1,008 feet for a view of Crooked Lake, and plunge down a ridge forested in hardwoods that makes this path an especially scenic one in October. But the nicest feature of this trail is its proximity to several urban areas, including Jackson, Ann Arbor, and western Detroit. Because of Pinckney Recreation Area, hikers from here don't have to drive all day just to find a scenic trail on state land. This location also draws a large number of mountain bikers looking for suitable terrain to pursue their activity. 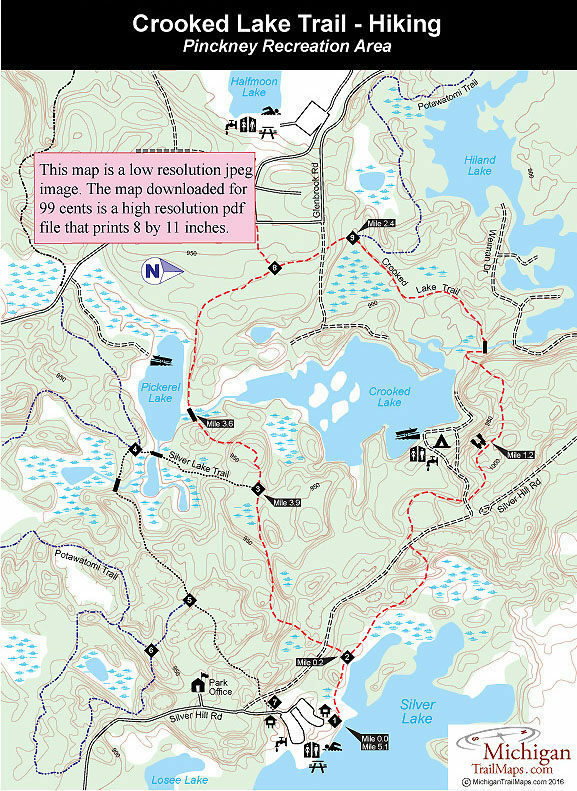 In 1990 the park staff instituted regulations that required bikers to follow Crooked Lake in a clockwise direction and hikers walk in a counter-clockwise direction. By following these regulations, at least you have time to react to bikers speeding towards you. If encounters with even conscientious cyclists who pull over to allow hikers to pass disturb your walk, find another trail. Crooked Lake and the park's Potawatomi Trail draw more mountain bike activity than any other routes in southeastern Michigan and maybe any other trail in the state. Along with October, when fall colors peak, mid-May is a pleasant time to walk this trail, when the ponds and marshes are ringed by wildflowers and waterfowl can often be sighted on the lakes. These same low-lying areas make the area a little buggy in late June through July, although not excessively bad. There are two posted trailheads in the day-use area, with the Crooked Lake one at the display map off the upper parking lot. Actually, this trailhead marks the beginnings of both Potawatomi and Crooked Lake trails as well as the Silver Lake Trail. The trail heads north to skirt Silver Lake, weaving between low-lying wet areas and young stands of trees and then passing the return trail. You continue straight. Although you can hear boaters and water skiers on the main body of the lake, the trail is following a narrow inlet of its western shore where in spring and fall a variety of waterfowl can be sighted. Within a half mile of the start, the trail swings west and begins a long ascent away from the lake to cross Silver Hill Road. 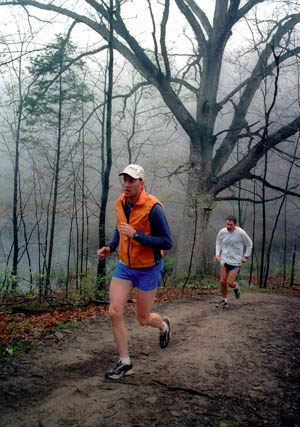 On the other side of the road, the trail cuts through an older stand of oak and breaks out on a grassy ridge, where you have a good view of Pinckney Recreation Area's rugged interior. The trail crosses the dirt access road to Crooked Lake Campground, and then climbs to a highpoint of 1,008 feet, where there is a view of Crooked Lake and the surrounding ridges and a bench to sit and enjoy it from. The only obtrusion here is a power line that passes through. From the viewpoint, the trail makes a half-mile descent, passes a mileage post (Mile 9) and a few more glimpses of the lake along the way, and bottoms out at a bridged creek that flows between a small pond to the north and Crooked Lake. Just beyond this creek, you arrive at post No. 9 at Mile 2.4. Hikers continuing on the 17.5-mile Potawatomi Trail would head north (right). Crooked Lake Loop swings south (left), crosses another bridge and then makes a gentle climb to Glenbrook Road, a private drive. On the other side of the road, the trail remains in the woods as it winds towards the south end of Crooked Lake. At post No. 8 is a spur that heads east (right) to the day-use area on Halfmoon Lake. Eventually you swing east and skirt a ridge while overlooking Pickerel, the third lake passed along the way. The structure at the west end is a fishing pier, and that at the east end is a footbridge along the Silver Lake Trail. You descend the ridge to an even more impressive footbridge across the small river between Pickerel and Crooked lakes. Reached at Mile 3.6, the bridge makes a nice spot to sit and enjoy the view of the two lakes and surrounding ridges. From the stream, you climb a pair of hills and in a third of a mile come to post No. 3, marking the junction of Silver Lake and Crooked Lake trails. Continue east (straight), and soon you'll be following a ridge and looking down at marsh ponds on both sides before ascending to a highpoint of 970 feet. The trail makes a steady descent from here and soon crosses Silverhill Road for the second time at Mile 4.7. On the other side of the road, you pass yet another small pond and return to a junction with the first leg of the trail along Silver Lake, where the upper parking lot trailhead is reached by heading south (right).